The Olympic rings, the symbol of the games, became the symbol of Sochi–or at least four of them did–over the weekend. American viewers witnessed a glitch that marked a Mona Lisa of an opening ceremony with a pimple. Sochi happens. 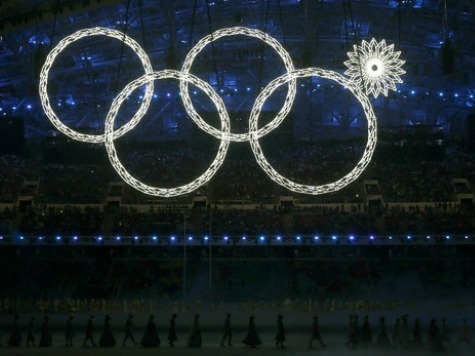 Russians watched five snowflakes flawlessly morph into the five Olympic rings. Perfection–or at least the perception of it. The doctored broadcast plays a bit like Sochi itself. Russians can call hovels “hotels” but there’s no hiding the toilet-water colored tap water. They can build majestic arenas but they can’t get cash-strapped Russians to buy tickets, as the half-empty house for the team skating event attests. Where are Mr. Ernst’s special-effects manipulators to CGI in a cheering crowd when you need them? The stubborn snowflake’s magical appearance on Russian TV as an Olympic ring recalls the magical disappearance of fallen-from-favor Bolsheviks from photographs during the Stalin era. In the most famous instance, immortalized on the cover of David King’s The Commissar Vanishes: The Falsification of Art and Photographs in Stalin’s Russia, the dictator who summered in Sochi stands with three revolutionaries, then two, then one, then alone. The cropped deceptions contained a truth: the men erased inside the picture had been erased outside of it as well. But for a more apt antecedent to the four-ring games one must travel further back in Russian history than the twentieth-century unpleasantness–as the Disneyfied yet dignified opening ceremonies did–to a Russian monarch every bit the strongman as Vladimir Putin in all but gender. Putin merely brought the Olympics to Russia. Catherine the Great sought to bring Russia to the Olympics. She partly rationalized her imperial designs to the south with pen pal Voltaire by revealing ambitions to revive the long-dormant ancient Greek games once her armies had captured Athens. Catherine’s advisor, enforcer, and lover Grigory Potemkin never made it that far. But he did capture the Crimean Peninsula, overlooking the same Black Sea that Sochi rests upon, and parts of nearby southern Ukraine. History repeats itself on the Black Sea. The Potemkin Olympics display flashy computer animation, futuristic venues that sprouted from nowhere, and a winter games in the subtropics. The spectacle hides the obscene reality that a nation with a per capita GDP one-third that of the United States has spent more than $50 billion–more expensive than all past winter games combined by some estimates–on a bread-and-circuses festival that projects Russian power at the expense of the Russian people. It’s not as though Russia lacked for suitable cold-weather alternatives. So why stage the Winter Olympics at their version of Miami Beach? Peter made a swamp into a city. Khrushchev launched a man into space. Putin put the winter games in a summer resort. There’s a truth in that snowflake doctored into a ring, just as there were truths in Stalin’s proto-photoshop job and Potemkin’s riverside facades. Sochi’s overdone Olympics is a nation advertising its insecurity complex. Why must the homeland of Dostoyevsky and Tchaikovsky and Solzhenitsyn so desperately play the showoff? From Potemkin’s villages to Stalin’s five-year plans to Putin’s Winter Olympics subtropics spectacle, the country caught between west and east constantly seeks to prove to those on the other side of the Carpathians that it’s modernizing. Whether these propaganda campaigns actually correspond to progress seems secondary. Like the boast that the Motherland invented television at the opening ceremonies, the Russian ruling class has grown accustomed to telling lies to themselves. Sochi is largely about getting the rest of the world to believe them. One can’t help but think that Russians have seen all this before. Sport, like Potemkin’s peasant actors, serves as a prop for one elongated national infomercial. Daniel J. Flynn, the author of The War on Football, A Conservative History of the American Left, and other books, edits Breitbart Sports.